We are really proud to share the news with you of our new Head Boy and Head Girl. This is a great honour for these children. They have been chosen because they are fantastic role models to other children in the school. They have many outstanding qualities including; thoughtfulness, excellent attitudes to learning, super attendance and positivity towards any challenge. Throughout the year they will carry out lots of duties including, helping in assemblies, showing visitors around the school and representing the school at events and special occasions. 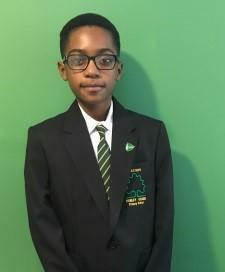 “Hello, my name is Nathan, “Hello, I’m Kismat and I am in Y6H. out any duties to the best of my abilities. Green has ever had a Head Boy or Girl. environment at school where they get .................................................................. the most out of their education."